The annual event raises money for Operation Heal Our Patriots, a Samaritan’s Purse project for wounded veterans and their spouses. The seventh annual High Country Warrior Ride on Saturday, May 19, raised $16,600 in support of Operation Heal Our Patriots, the Samaritan’s Purse ministry to military couples with a spouse injured or wounded in combat operations after 9/11. One hundred and twenty motorcyclists on 71 bikes rolled out Saturday morning from Samaritan’s Purse international headquarters in Boone, North Carolina, and enjoyed a scenic route through the beautiful Blue Ridge Parkway. More than 20 participants were veterans themselves. Mark Speir started the High Country Warrior Ride to support Operation Heal Our Patriots. Mark Speir, head football coach of Western Carolina University, founded the event after helping with renovations at Samaritan Lodge Alaska, the summer base for Operation Heal Our Patriots. He returned last year with his son and volunteered for two weeks. 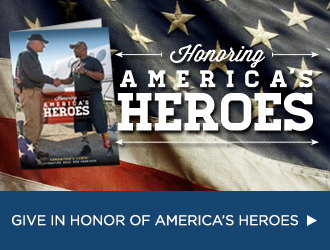 “Operation Heal Our Patriots is an unbelievable ministry. It is used to heal marriages of wounded veterans and to help them spiritually,” he said. Since the project’s start in 2012, more than 800 couples have traveled to Alaska for a week of Biblically based marriage enrichment, which includes classes with retired military chaplains as well as wilderness activities such as kayaking, fishing, and wildlife viewing. We praise God that more than 340 individuals have made commitments to Jesus Christ and 428 have been baptized. Nearly half of the couples in the program have rededicated their marriage to the Lord, most while in Alaska but some during annual reunion events. Army Staff Sergeant Adam Palmer spoke to Warrior Ride participants about how God changed his life last year in Alaska. Adam Palmer is one of hundreds of wounded veterans who have participated in a week of marriage enrichment in Alaska. Adam served three tours in Iraq and during his final tour his vehicle was hit by an improvised explosive device. Several of Adam’s limbs were crushed and his femoral artery was severed. After his injuries, Adam had to face the reality of leaving behind his life as a soldier. “Since that’s the only thing I knew I was, that was really difficult,” he said. In Alaska, Adam discovered that the only way to move forward was to trust Christ. He rededicated his life to God and his wife prayed to receive Jesus as her Lord and Savior. The couple was baptized in Lake Clark and recommitted their marriage to God. Adam said the spiritual truths he learned in Alaska will provide the “foundation to keep fighting and the hope to keep trying” even during difficult times. Bill and Cheryl Warman of Morgantown, West Virginia, joined the High Country Warrior Ride for the first time this year. Bill, an Army Master Sergeant who served for 37 years, appreciates that Operation Heal Our Patriots helps restore marriages. The ride raised more than $16,000 for Operation Heal Our Patriots. Melanie and LaBaron Hollar from Boone were also first-time participants. Melanie is a nurse in care management and often works with veterans. She has been at their side as they struggle with post-traumatic stress disorder years after their military careers have ended. David Trivette is a member of the Boone Chapter of the Christian Motorcyclists Association, which provided safety and security teams for the event. 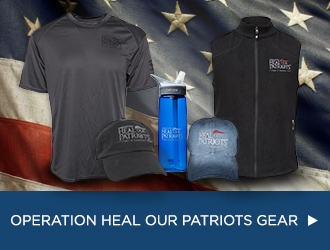 David supports Operation Heal Our Patriots because the program is focused on the Gospel. Before the ride, participants prayed for Operation Heal Our Patriots and our country’s veterans. The 2018 season of Operation Heal Our Patriots kicks off May 27, with 160 couples expected to participate in Alaska between May 27 and Sept. 14. One hundred fifty are U.S. couples and 10 Canadian military couples are invited for the final week. Year-round follow-up through the project’s aftercare program includes regular contact and encouragement, prayer support, help finding a local church, an annual reunion open to all participants, regional advanced training retreats, and crisis care as requested. Please pray that marriages would be healed this year during Operation Heal Our Patriots. Pray that many individuals will come to know Jesus as their Lord and Savior.